In order to encourage economic growth and development, governments often put in place a range of policies aimed at attracting firms to specific areas of a country. Yet relatively little is known about their implications for efficiency.This column argues that such subsidies have costly long-run effects, both on the productive efficiency of the economy and in terms of welfare. Moreover, place-based policies do not necessarily decrease spatial disparities. States, regions, and cities spend significant resources in a competition to attract large firms. Amazon’s second headquarter search in 2017 is a striking illustration of this phenomenon. More than 200 US cities engaged in the contest to host the internet retailer – a contest that has been recently narrowed down to 20 finalists. Most of these top contenders put together major economic incentives as part of their bid – for instance, New Jersey offered $7 billion in tax breaks over 20 years. Local subsidies to firms are not a new phenomenon. Kline and Moretti (2014) report that, overall, an estimated $95 billion are spent annually in various forms of local subsidies to firms in the US. In Europe, a similar phenomenon is at play, albeit with different rules. In general, the European Commission prohibits subsidies to firms by national or local governments, as these state aids are seen as giving an unfair advantage to some firms, distorting competition and trade.One notable exception, however, is regional policy – subsidies from governmental entities are possible in specific disadvantaged regions, which lag behind in terms of population density or GDP per capita. Despite the ubiquity of firm subsidies through place-based policies, we know relatively little about their aggregate efficiency implications. The usual justification of these is that they help push some regions out of their laggard status – attracting new firms to specific areas helps create local jobs that will in turn lead to the creation of more jobs, through agglomeration economies. However, this reasoning is essentially local. In the aggregate, positive effects in the targeted region may be counterbalanced by negative effects in other regions. Furthermore, these policies distort firms’ location choice. Perhaps firms would have been more productive – benefiting from easier access to other firms, a more adequate labour force, etc. – had they elected to locate in more dynamic regions. Therefore, while place-based policies may reduce inequality between regions, they may also reduce efficiency, increasing the misallocation of factors of production – firms and workers – over space. Whether place-based policies even reduce disparities between regions is not entirely clear, as this depends on the type of firms that they attract. If mostly large, productive firms respond to place-based policies, spatial inequalities will be reduced. If instead small, unproductive firms are attracted to the subsidised areas while large, productive firms remain in dynamic regions, place-based policies may even reinforce geographical disparities. Overall, these place-based policies likely induce a complex reallocation of factors (firms and jobs) across space, so that their aggregate impact on both efficiency and inequality is a priori ambiguous. In a recent paper (Gaubert 2018), I propose a model of firms’ location choice in a country, which features many ingredients necessary to analyse this type of policies. First, firms operate in a variety of sectors, and within sectors, firms are heterogeneous in their level of productivity. The model therefore allows for the heterogeneous effect of policies on firms of different sizes and operating in different industries. Second, firms choose where to locate among a variety of cities in a country. This location decision results from a trade-off that can be summarised as follows. On the one hand, locating in a large city makes firms more productive – through agglomeration economies, which summarise the economic advantages of density. For instance, large cities facilitate the flow of knowledge between workers and between firms, making them more productive on average. Large cities also give better access to an adequate workforce, as well as to input suppliers and potential customers (Ellison et al. 2010). In the model, I assume that there is a complementarity between a firm’s efficiency, and whatever the city has to offer in terms of productivity enhancement. That is, the most efficient entrepreneurs benefit disproportionately from agglomeration effects. Combes et al. (2012) have provided suggestive evidence in support of such heterogeneous effects of agglomeration economies. The other side of the trade-off is that these benefits come at a cost – producing in larger cities is costlier because of higher land rents and higher wages. Given the complementarity between firm efficiency and agglomeration forces, only the most productive firms are willing to pay the higher cost of locating in large cities. Before turning to the analysis of place-based policies within this model, I emphasise stylised facts that the model helps rationalise. For instance, in the model and in the data, both firms’ value-added and employment increase on average with city size, but employment increases less fast. Furthermore, sectors that rely heavily on inputs that are particularly expensive in large cities (for instance because their production is very land- or labour-intensive) tend to locate on average in smaller locations, which offer cheaper inputs. Finally, in the data, sectors that tend to locate in larger cities are also the ones for which large firms are particularly large. The model can rationalise this pattern – initial differences in productivity between firms induce sorting across city sizes. This, in turn, reinforces firm heterogeneity, as firms in large cities benefit from stronger agglomeration forces. Overall, this mechanism leads to amplified disparities in firm size. I quantify the model using French firm-level data, and use it in particular to estimate the potential aggregate effect of various place-based policies that target firms. For instance, I simulate the new spatial equilibrium that results from the implementation of a tax-relief scheme targeted at firms locating in smaller cities. Specifically, I simulate the effect of a subsidy for firms locating in the smallest cities corresponding to 2.3% of the population, matching the size of an existing place-based policy in France. The subsidy corresponds to 12% of firms’ profits in these areas, paid for by a lump-sum tax levied on all firms in the country. The model predicts large local effects of the policy. In targeted areas, the number of establishments grows by 19%. The corresponding local increase in population is, however, only 4%. This is because the firms attracted by the policy in these areas are small and have low productivity. Beyond evaluating these local effects, the counterfactual exercise also gets at general equilibrium effects – for different levels of the subsidy, I compute aggregate total factor productivity (TFP) and welfare. The welfare measure I use is the real income of the representative worker. It does not account for other elements that can arguably be in the objective function of the decision maker and which often motivate these policies, such as measures of equity. In that sense, the (negative) welfare effects can be seen as policy costs, to be weighted against potential benefits that are outside the model. The simulation shows that these place-based policies have costly long-run effects, both on the productive efficiency of the economy and in terms of welfare. 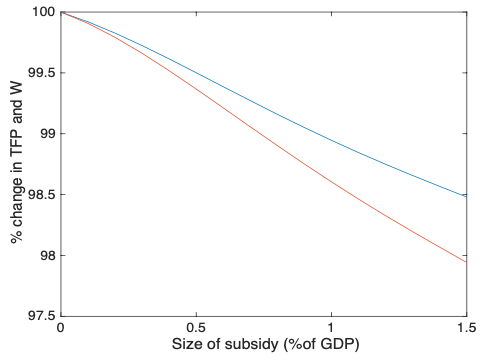 A subsidy to smaller cities that amounts to 1% of GDP leads to a loss of 1.05% in TFP in the aggregate, and a loss of 1.4% in welfare (see Figure 1). Even if the policy allows to decrease congestion in large cities overall, the welfare gain from decreasing congestion is largely dominated by the negative TFP effect. Furthermore, perhaps surprisingly, the type of place-based policies I study do not necessarily decrease spatial disparities. The intuition for this result is as follows. 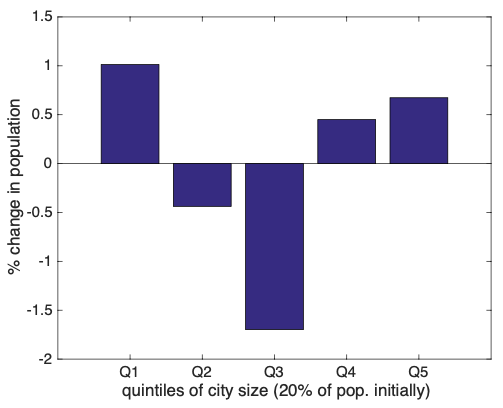 The counterfactual equilibrium is characterised by (i) growth in the size of smaller cities; (ii) a decrease in the population of midsize cities; and (iii) an increase in the population of the largest cities (see Figure 2). This last effect comes from the fact that, as midsize cities lose population in favour of smaller cities, they offer less agglomeration externalities. As a consequence, these midsize cities become less attractive compared to larger cities. Small and large cities thus expand at the expense of midsize cities. Quantitatively, this may even lead to a rise in spatial disparities, running counter to the rationale for these policies. Combes, P-P, G Duranton, L Gobillon, D Puga, and S Roux (2012), “The productivity advantages of large cities: Distinguishing agglomeration from firm selection”, Econometrica 80(6): 2543-2594. Ellison, G, E L Glaeser and W R Kerr(2010), “What causes industry agglomeration? Evidence from coagglomeration patterns”, American Economic Review 100(3): 1195-1213. Gaubert, C (2018), “Firm sorting and agglomeration ”, American Economic Review 108(11): 3117-53. Kline, P and E Moretti (2014), “Local economic development, agglomeration economies, and the big push: 100 years of evidence from the Tennessee Valley Authority”, Quarterly Journal of Economics 129(1): 275-331.